The recent success of the Blue Bears in the CIAA is only part of their legacy. Learn about the great women’s basketball program from the early years. See how the rivalry between Livingstone and JC Smith grew from baseball rather than football, even though these two schools played in the first ever HBCU varsity football game. 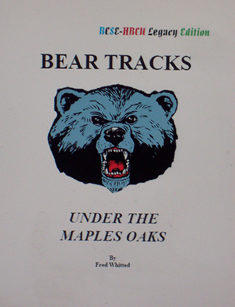 Before the Blue Bears won back to back basketball titles, they won back to back championships football, as well as wrestling. This is the most detailed history of Livingstone athletes since the 1960s. Get to know Livingstone coaches and athletes who made their mark over the years. This book will be available on August 17, 2015. Pre-sale begins July 29, 2015 at $30.00, plus tax and shipping. A portion of the price goes to the Andrew and Annette Whitted Scholarship Fund which supports Livingstone College.